It all started when we got a call from one of our clients about rehoming their Brownbanded Bamboo Shark, Bertha (say that 3 times fast 😉 ). Her owner explained Bertha had outgrown her 1200g aquarium, and she needs a bigger home. Of course, Parrott Aquatic was thrilled to help. So we reached out to one of the top aquariums in the country, Ripley’s Aquarium of the Smokies. There is plenty of preparation and planning involved to execute this larger-scale transfer. This operation requires a number of aquarium skills and expertise in engineering, logistics, and marine biology. Kinny and the team researched the best way to transfer Bertha from our client’s aquarium in Pigeon Forge, TN to Ripley’s Aquarium of the Smokies in Gatlinburg, TN. Although the two cities are only 7.4mi apart, the curvy roads and seasonal traffic can cause the drive to be very lengthy and extend up to 2-3 hours. It was important they choose the right date and time to transfer Bertha to avoid stressing her during the move. They also had to consider dimensions of trailers, entrances, and doorways. They had to decide the best route to take to Ripley’s and develop a backup plan in case of seasonal traffic. They had to confirm their moving trailer would fit in the employee parking lots at both locations – the list goes on. The point is, they had to consider a lot of factors before they could even begin building Bertha’s moving container. 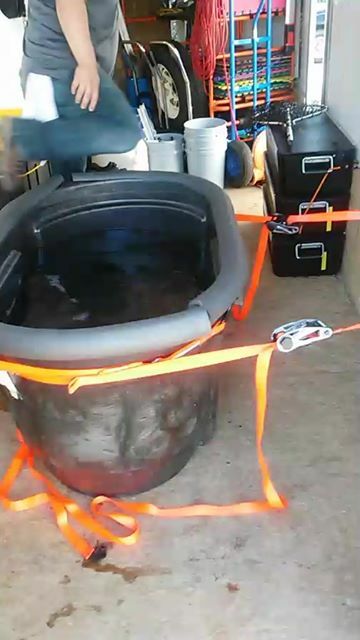 After determining the best way to transfer Bertha, Parrott Aquatic designed and engineered a unique transportation container complete with a custom lid. Eight vices are strategically placed on the lid to keep the container closed on the one-way winding road to Ripley’s. No air pump was used during this transfer since we were able to move her quickly. Ripley’s Aquarium of the Smokies and Parrott Aquatic are pros in the aquarium industry. The combined knowledge from everyone involved allowed this rehoming to take place. All three parties (Our client, Parrott Aquatic, and Ripley’s Aquarium) must be knowledgeable and experienced in delicate aquarium ecosystems and Brownbanded Bamboo Sharks. I’m still learning all of the ins and outs to this hobby so I won’t try to pretend like I know how to do their jobs. I do know that I’ve been working with Parrott Aquatic for a year, and I still learn something new about the hobby every day. With that said, it takes some serious experience, knowledge, and skill to pull off a move like this. Bertha the Brownbanded Bamboo Shark and Juanita the Yellow-Headed Eel are best friends. Bertha is a 54″ Brownbanded Bamboo Shark weighing in at about 13lbs. (Yes, I’m still learning about fish and aquariums, and I may have dramatically overestimated Bertha’s weight in one of the videos to be 75lbs. But hey – I’m a Marketing Specialist, not an aquarist or the internet…yet.) These sharks typically grow to be about 41″, so Bertha is abnormally large for her species. If you’re looking for them in the wild, you can find them in water between Japan and Australia. Bertha sharks are nocturnal and require lots of dark hiding places if kept in an aquarium. They are carnivorous and we recommend you feed them daily with a variety of meats like shrimp, squid, fish, and scallops. We arrive at our client’s aquarium around 9am. This tank is 1200g and consists of two animals: Bertha the Brown Banded Bamboo Shark and her tank mate, a Yellow-headed Eel the employees call Juanita. These two love to share their tank and their tubes with each other. To our surprise, the tank had a major charcoal leak the night before the move which caused the entire tank to look dark and cloudy. Don’t worry though, charcoal is nontoxic to fish! 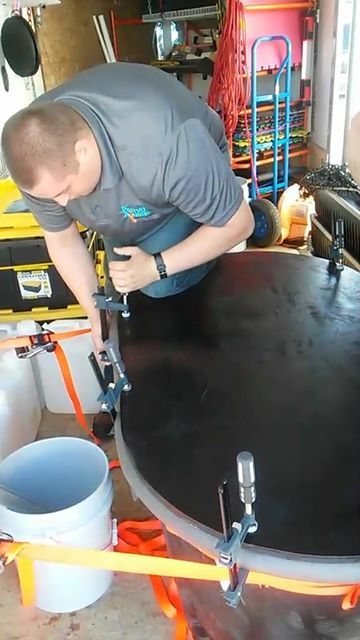 The guys took a little bit of time performing the 200g RO Saltwater change prior to moving Bertha and brought a couple different strategies and pieces of equipment to perform the move. The main piece of equipment is a large net with non-abrasive rubber netting to keep the net from cutting into or harming Bertha. The second one is a backup net made of fabric. The strategy is to trick Bertha into thinking we are feeding her, scoop her up with the net, lay her on the towel on the floor, then calmly pick up the towel, and walk her to the transfer tub. Did that actually happen? Kind of. Skip to 10:50 in the video above to see the Pros from Parrott Aquatic move Bertha the Brownbanded Bamboo Shark! As expected with most things in the hobby, Bertha does the exact opposite of what we want. Tricking her into the net is easy enough for Joshua Parrott, but the handoff was a little rocky. Joshua explains Bertha is very relaxed in the water but very lively in the net, and he underestimated how powerful she is. The Pros immediately place her on the towel, but they take a much faster pace moving her to the transfer container than we originally planned. Run guys! 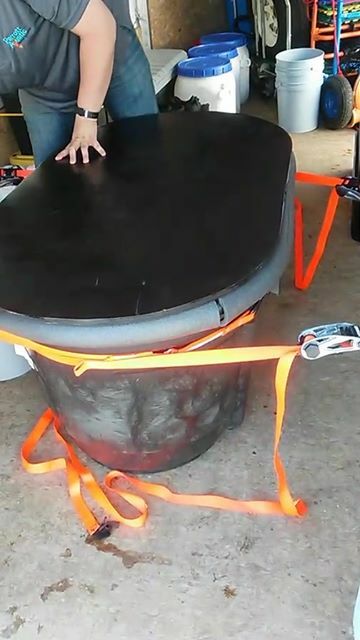 After placing her in the transport container, Josh Kirk explains Bertha tried to launch herself forward out of the towel and out of their grip! Coincidentally, Brownbanded Bamboo Sharks are very strong and are known for knocking heavy objects around in their aquariums. It’s no wonder she’s so powerful! Custom lid to contain Bertha during transport. 8 Vices are strategically placed to secure the lid. Kinny and Josh K tighten the vice onto the lid and confirm the moving container is secure. We have limited time to get to Ripley’s Aquarium since there we opted out of using an air pump, so we head to Ripley’s Aquarium of the Smokies immediately. We call Ripley’s on our way and get in touch with Cassie. Cassie coincidently serviced Bertha’s old aquarium before Parrott Aquatic and knew Bertha well. Cassie meets us at the gate to Ripley’s Aquarium and starts dropping knowledge bombs about Brownbanded Bamboo Sharks. While we wait on Bertha to acclimate to her new aquarium, one of the employees gives us an impromptu tour behind the scenes at Ripley’s Aquarium. Most of the tour I was able to capture live, but there are some parts I am asked to keep private. Off-camera we see huge quarantine tanks where Bertha will be held until she’s introduced to the Stingray Bay. On camera, we see a beautiful sea turtle, one of the largest transparent skimmers in the world, and massive aquarium plumbing lines and filtrations systems that almost look like art. We see where the mermaids jump in to perform their underwater show, and more fish poop than I will see in a lifetime. Our last off-camera moment we learn about the program and touch screen system 1 of 4 certified technicians use to control all of the aquarium’s filtrations systems at Ripley’s in the Smokies. We meet Bertha at the end of our tour near the quarantine tanks where we checked her in. I pet her for the first and last time, and our team says our goodbye’s before we head back to headquarters. We may get some updates and pictures of Bertha from Cassie at Ripley’s. If you’d like to see her, swing by Ripley’s Aquarium of the Smokies in about a month and say hi to Bertha at the Stingray Bay Aquarium. We’d like to take the opportunity to thank our Client for trusting us with moving their business mascot and family member, Bertha. We’d like to thank Ripley’s Aquarium of the Smokies for taking Bertha in, using the highest quality services for our beloved animals, and for sharing so much knowledge with us. We don’t care what the polls say, you’re our #1 Aquarium! While we’re at it, we’d also like to thank you, our readers and social media followers, our customers and vendors for all of your support.